When President Barack Obama took office in January 2009, he had no shortage of challenges to address: an economy on the verge of complete meltdown, two wars, and a health care system so broken that 44,000 people a year die for lack of coverage in the wealthiest country in the world. Accordingly, President Obama laid out an ambitious agenda, counting on the strong Democratic majority in Congress to help push it through. But according to guests on BILL MOYERS JOURNAL, the President was also courting the help of industry. Matt Taibbi and Robert Kuttner, two journalists who cover the intersection of money and power in the nation's capital, explain how two powerful industries  health care and global finance  exercise their influence in Washington to ensure the new laws will be sufficiently profitable for them, and how that may stand in the way of real reform. Progressive reformers welcomed the passage of what they considered a strong health care bill in the House, but were hoping for strong backing from the Obama administration to keep the Senate from weakening the bill. The strong backing did not materialize, and the Senate announced a compromise bill in mid-December without a public option or an opportunity for people over 55 to buy into Medicare. The public option had been a primary goal for progressive groups, who believed that it was an effective way to force insurance companies to lower their prices. The public option  like several other cost controls including allowing the government to bargain for lower drug prices for Medicare or allowing drug reimportation  was removed because of vigorous opposition from the health care industry. There are two ways, if you're the president of the United States sizing up a situation like this, that you can try and create reform. One is to say, well, the interest groups are so powerful that the only thing I can do is I can work with them and move the ball a few yards, get some incremental reform, hope it turns into something better. The other way you can do it is to try to rally the people against the special interests and play on the fact that the insurance industry, the drug industry are not going to win any popularity contests with the American people. And you, as the president be the champion of the people against the special interests. That's the course that Obama's chosen not to pursue. The bill, as it now stands, has divided Democrats (Republicans had signaled earlier that they wouldn't be supporting any version), with some urging to kill the bill and try again later, and some arguing that it is better than nothing, and Democrats might not have another opportunity for 20 years. >>Read voices from all sides of the debate below. Mike Taibbi argues that something similar may be happening as Congress attempts to reform our financial system. Many economists have argued that left unchanged the system still poses the risk of another epic collapse in the future. The banks were quick to try to stymie reform. For example, as Gretchen Morgenson and Don Van Natta Jr. reported in the NEW YORK TIMES in June, "The nine biggest participants in the derivatives market  including JPMorgan Chase, Goldman Sachs, Citigroup and Bank of America  created a lobbying organization, the CDS Dealers Consortium, on Nov. 13, a month after five of its members accepted federal bailout money." But according to Taibbi, the big banks have something even more powerful  friends in high places. In a recent piece for ROLLING STONE, "Obama's Big Sellout," Taibbi connects the dots between a host of administration officials and Robert Rubin, the Treasury secretary under Clinton and an alumni at Goldman Sachs and Citigroup  two banks who owe their continued existence to government bailouts. Most people that I've talked to have taken one of two positions on this. One is that Obama was naïve, that he doesn't know a whole lot about the financial services industry, and he felt the need to rely upon people who'd been there before, people who've had these jobs before, and you know, who have this expertise. And there's another school of thought that look, he took more money from Wall Street than any other presidential candidate in history. Goldman Sachs was his number one private campaign contributor. And if you just look at the evidence, it's just really business as usual. This is what the Democratic Party has done since the mid-'80s. They've relied heavily on the financial services industry to fund their campaigns. And it's the quid pro quo. They gave a lot of money to help these guys run, and in return, they get the big jobs, you know, in the White House. But, despite the immense power of Wall Street, Kuttner still believes that meaningful financial reform is possible, and that President Obama could change course, "I think there is a chance  I don't think I would bet my life on it  but I think there's a possibility that by the fall of 2010, looking down the barrel of a real election blowout, you could see him change course, if only for reasons of expediency, but hopefully for reasons of principle as well, if he feels that the public doesn't have confidence that he is delivering the kind of recovery that the public needs. This is a guy who is a very smart, complicated man. And I think don't speak too soon, for the wheel's still in spin. I don't want to totally give up." >>Read more about the debate over financial reform below. Robert Kuttner is co-founder and co-editor of THE AMERICAN PROSPECT magazine, as well as a distinguished senior fellow at the think tank Demos. He was a longtime columnist for BUSINESS WEEK, and continues to write columns in the BOSTON GLOBE. Kuttner has written seven books. His most recent, The SQUANDERING OF AMERICA, explores the political roots of America's narrowing prosperity and the systemic risks facing the U.S. economy. The book was recently honored with the Sidney Hillman Journalism Award. Kuttner has just begun work on a new book on trade, equality, efficiency, and the challenge of regulating global capitalism. Kuttner's best-known earlier book is EVERYTHING FOR SALE: THE VIRTUES AND LIMITS OF MARKETS (1997). The book received a page one review in the NEW YORK TIMES BOOK REVIEW. Of it, the late economist Robert Heilbroner wrote, "I have never seen the market system better described, more intelligently appreciated, or more trenchantly criticized than in EVERYTHING FOR SALE." Kuttner's other previous books on economics and politics include; THE END OF LAISSEZ-FAIRE (1991); THE LIFE OF THE PARTY (1987); THE ECONOMIC ILLUSION (1984); and REVOLT OF THE HAVES (1980). Kuttner's magazine writing has appeared in THE NEW YORK TIMES MAGAZINE and BOOK REVIEW, THE ATLANTIC, THE NEW REPUBLIC, THE NEW YORKER, DISSENT, COLUMBIA JOURNALISM REVIEW, and HARVARD BUSINESS REVIEW. He has contributed major articles to THE NEW ENGLAND JOURNAL OF MEDICINE as a national policy correspondent. For four decades, Kuttner has considered it his intellectual and political project to revive the politics and economics of harnessing capitalism to serve a broad public interest. He has pursued this ideal as a writer, editor, teacher, lecturer, commentator and public official. ROLLING STONE contributing editor, Matt Taibbi, graduated from Bard College in New York in 1991 and finished his studies at Leningrad Polytechnichal University in Russia. Over the years, Taibbi has had a varied career, working as a freelance reporter and professional baseball player in the Soviet Union and Uzbekistan, and later playing professional basketball in Mongolia. In between, he also worked as an investigator in a Boston-based private detective agency. He eventually resettled in Moscow, where he founded, with writer Mark Ames, an English-language satire newspaper called the EXILE, which was known for a mixture of humorous stunts and hard-nosed reporting of corruption both in Russian government and the American aid community. The paper was the only publication to correctly predict the 1998 Russian financial crisis. In conjunction with the Russian paper STRINGER, for which Taibbi wrote in Russian, the EXILE also wiretapped the telephone of Kremlin chief of staff Alexander Voloshin in 2001. In his time in Russia, Taibbi produced a great deal of participatory journalism, working in a variety of jobs to show readers the reality of Russian life. He worked at various times as a bricklayer in Siberia, a migrant farm laborer, a moonshine dealer, a professional clown, a keeper in an elephant cage, a security guard, and a construction worker in an Orthodox monastery. Taibbi returned to the U.S. for good in 2002 and founded the Buffalo-based newspaper THE BEAST. He left that paper a year later to work as a columnist for the NEW YORK PRESS, and eventually as a contributing editor for ROLLING STONE. Taibbi won the 2008 National Magazine Award for Columns and Commentary for three columns he wrote in ROLLING STONE, "Worse Than Bush"; "My Favorite Nut Job"; and "Obama's Moment." His NEW YORK PRESS column on George Bush's prewar press conference, "Cleaning the Pool," was included in the BEST POLITICAL WRITING 2003 anthology, and a year later he was named one of the 35 most influential New Yorkers under 35 by the NEW YORK OBSERVER. In his first original book, THE GREAT DERANGEMENT (2008), Taibbi dives into the heart of the American psyche in a madcap journey that brings into focus life in the American Empire, right here, right now. He's also the author of two essay collections, SPANKING THE DONKEY and SMELLS LIKE DEAD ELEPHANTS. View our complete coverage of the banking and bailout crisis from early warning from THE NEW YORK TIMES' Gretchen Morgenson in 2007 to date. 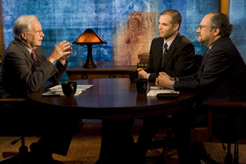 Complete coverage of health care on BILL MOYERS JOURNAL. Articles by Robert Kuttner on the HUFFINGTON POST. Articles by Robert Kuttner at the Demos think tank. "Wall Street Meets Its Match"
By Robert Kuttner, THE AMERICAN PROSPECT, November 30, 2009. By Matt Taibbi, ROLLING STONE, December 9, 2009. Archive of Matt Taibbi's weekly column in ROLLING STONE. "The Great American Bubble Machine"
By Matt Taibbi, ROLLING STONE, July 13, 2009. By Matt Taibbi, NEW YORK PRESS, January 14, 2009. "Mandates at Center of Democratic Civil War Over Health Care"
By Max Fisher, THE ATLANTIC WIRE, December 16, 2009. A roundup of opinions about the individual mandate and whether progressive Democrats should pass the bill. "White House as helpless victim on healthcare"
By Glenn Greenwald, SALON.COM, December 16, 2009. Greenwald argues that the White House got the health care bill it had planned to get all along. "Sleazy Sewers and Healthcare Reform"
By Kevin Drum, MOTHER JONES, December 16, 2009. Drum responds to Greenwald's piece above. "The Left is Playing with Fire"
By Jonathan Cohn, THE NEW REPUBLIC, December 16, 2009. Cohn, who wanted a public option but supports the current legislation, cautions fellow liberals against criticising the individual mandate. "Howard Dean: Health Care Bill 'Bigger Bailout for the Insurance Industry Than AIG'"
By Huma Khan and Jonathan Karl, ABC NEWS, December 16, 2009. Dean urged Democrats to kill the Senate bill, setting off a huge debate amongst Democrats. "20 Questions for Bill Killers"
By Nate Silver, FIVETHIRTYEIGHT, December 16, 2009. Silver asks questions to people who want to kill the bill. Responses and Silver's responses to those, can be found here. "A Sucker-Punched Harry Reid Throws in the Towel on Real Reform"
By John Nichols, THE NATION, December 14, 2009. "Stupefying Tax Breaks Shatter Illusion of Harsh Citi Deal"
By Heather Horn, THE ATLANTIC WIRE, December 16, 2009. Roundup of reactions to the news that the U.S. government was giving Citigroup a tax break as they repaid government bailout money. By Paul Krugman, THE NEW YORK TIMES, December 13, 2009. "Paul Volcker Picks Up A Bat"
By Simon Johnson, THE BASELINE SCENARIO, December 17, 2009. Economist Simon Johnson, a proponent of breaking up large banks, explains the latest moves by influential former Treasury secretary Paul Volcker. "Financial 'Reform' Preserves Too Big Banks, Too Much Speculation"
By John Nichols, THE NATION, December 13, 2009. By FELIX SALMON, REUTERS, December 11, 2009. "The Errors of Matt Taibbi." By Tim Fernholz, THE AMERICAN PROSPECT, December 11, 2009. Fernholtz accuses Taibbi of factual inaccuracies in his piece, "Obama's Big Sellout." Taibbi responds here. By Felix Salmon, REUTERS, December 11, 2009. Salmon fact checks Tim Fernholtz's fact check of Taibbi's piece, "Obama's Big Sellout." Amidst fading hopes for real reform on issues ranging from high finance to health care, economist Robert Kuttner and journalist Matt Taibbi join Bill Moyers to discuss Wall Street's power over the federal government. Bill Moyers lists his pick of the best books of 2009.